This uneven terrain traveling hexapod comes with eighteen(18) CDS5516 high performance 300 degree rotation servos which gives this hexapod 18 degrees of freedom. The CDS5516 servos have more than 14kg/cm of max holding torque allowing the hexapod to stand on only two feet. The CDS5516 servos have the capability of returning their current angle, torque, and working temperature when polled via serial interface. This feature allows for greater accuracy and control of each individual servo. Giving you access to critical information about each servo will also allow you to troubleshoot your sketches. The arduino mega 1280 and Mega IO expansion shield included in this robot kit make this hexapod a powerful, yet DIY-friendly robotics platform. The Mega's 54 I/O pins and multiple serial communications ports allow you to add many additional sensors and modules for all your robotic needs. It is possible to power the whole robot with only one 7.4v battery for the Arduino mega board as well as for both servo driver boards. Frame is made of 2mm surface-oxidized aluminum alloy board. M3*6mm nylon screws and nut * 4. M3*50mm hexagonal standoff * 4. Arduino Mega 1280 microcontroller board * 1. Mega IO Expansion Shield for Arduino Mega * 1. Hexapod robot frame kit * 1. Uptech CDS5516 Servos * 18. Servo driver board * 2. *Sample code for the hexapod robot. *You must import the below three libraries first. Serial.begin(115200); //For printing out data, or debugging. Serial2.begin(1000000); // Used for control servos on left side. Serial1.begin(1000000);// Used for control servos on right side. 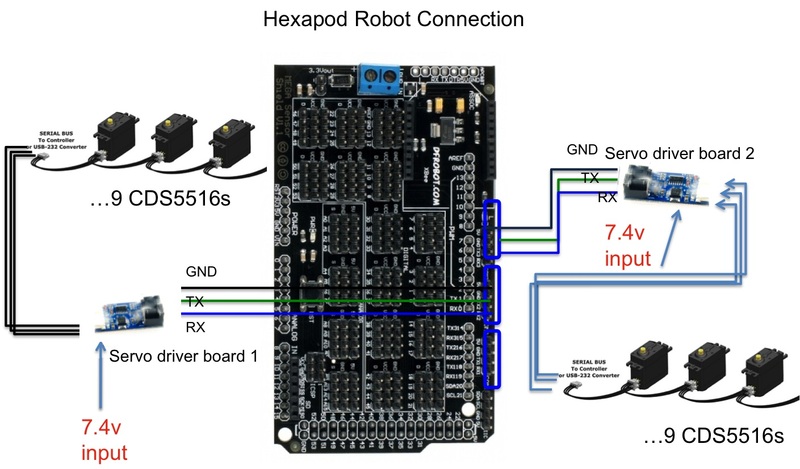 Get >Hexapod Robot Kit from DFRobot Store or DFRobot Distributor.